Derek and Vera Coull, guests at Lovat Lodge, Nairn. Guests of one of the only hotels that cater especially for disabled people in the north of Scotland have reacted with shock at news the establishment could soon close. Lovat Lodge Hotel in Nairn was founded on the recommendation of pioneering Scottish rheumatologist Dr Logie Bain and it is run by a charitable trust. But just a few weeks ago, a letter was sent to regular visitors informing them there was a danger the doors may close because “occupancy levels have been in decline for years”. The trustees wrote: “The point has now been reached where the number of guests being attracted to Lovat Lodge is no longer sufficient to cover overhead costs involved in such a specialist operation. However, some guests – some of them in their 90s – only found out about the potential closure when they tried to book for their next stay recently. 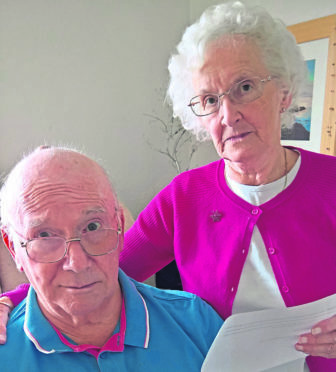 Derek and Vera Coull from Stonehaven have been enjoying Lovat Lodge for the past four years since Mr Coull, 77, suffered a stroke and they were on holiday there last week when they found out. Mrs Coull, 80, said: “We are very upset, we found out about the closure when we were up last week. We’ve been going up twice a year for the last few years. There is a wet room and you can hire a carer up there. Mrs Coull said the effect on some of the guests would be severe, particularly those who were older and more vulnerable. She said: “We noticed there were all these people who went there. There was one elderly man from Inverness who is going blind, he said this was the only place he could come to and get looked after. He said he would start going there once a month just to get some company, now that poor man will have nowhere to go. “There were four old ladies from different places, there were two from Aberdeen and another from Portknockie and they met up there a couple of times a year. Lovat Lodge was contacted for comment. 2018 marks the 50th anniversary of the opening of Lovat Lodge. Back in 1968, few facilities were available for anyone with special requirements looking for a holiday and Lovat Lodge was unique in providing the opportunity for many people to experience a break away from their home. Happily, much has changed over the past five decades, and the range of options has increased many-fold. However, this has also meant that, despite the considerable efforts that have been made to market the hotel to a wider population, occupancy levels at Lovat Lodge have been in decline for several years. The point has now been reached where the number of guests being attracted to Lovat Lodge is no longer sufficient to cover overhead costs involved in such a specialist operation, without increasing room rates beyond an affordable level. Sadly, therefore, we have to announce that, after Christmas and New Year, it is possible that Lovat Lodge may be closing down permanently. We realise that this will be a huge disappointment to our many loyal guests, but, unfortunately, we have no alternative. The hotel will continue to operate as normal until the end of this year, and anyone who wishes to book a final stay with us is welcome to contact us in the usual manner. Should the hotel not re-open in 2019, those of you who have already made a booking for 2019 will be contacted separately by letter, and a full refund of any amounts paid will be made. Lastly, on behalf of all the staff, the Trustees would like ot thank you all for your trememndous support over the years, and we wish you well for the future.